The last couple of weeks has seen several players promoted from Salem to Portland, and that trend continued this week with sources confirming that shortstop Mauricio Dubon was moving up to Double-A. Over his first three games with the Sea Dogs, he has gone 5-for-11 with a double, triple, two walks and two strikeouts. Dubon joins second basemen Yoan Moncada, outfielder Andrew Benintendi, right-hander Ben Taylor, and left-hander Jalen Beeks who have all received similar promotions in recent weeks. Ian Cundall, SoxProspects.com's Director of Scouting, was a busy man recently and filed several scouting reports. 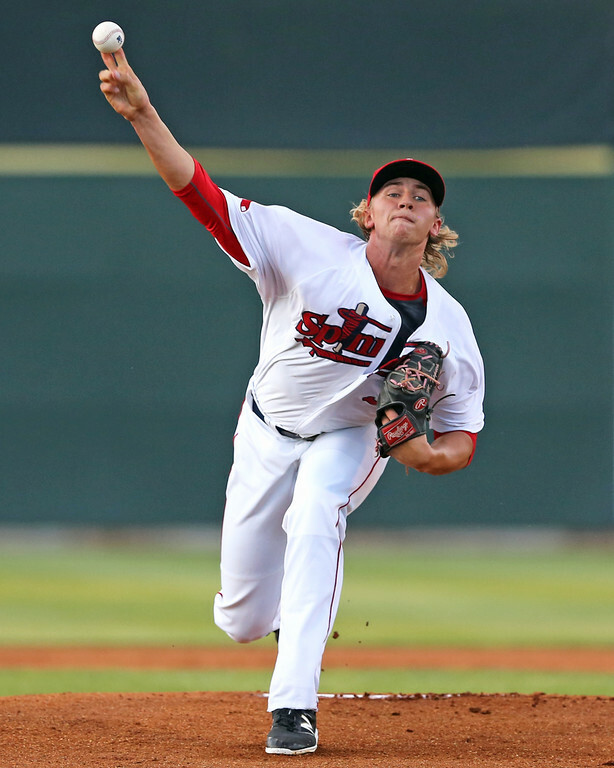 The first was after he was able to catch righty Michael Kopech (pictured, right) start opening night for the Lowell Spinners. This was the first start of the year for the fifth ranked prospect on the SoxProspects.com rankings after getting a late start due to a broken hand, a result of an altercation with a teammate. He went 4 1/3 innings in the rehab start without allowing a run, and he has since been sent to Salem. Making the most of his time in Lowell, Cundall also was able to give some additional notes on other Lowell pitchers in another edition of Scouting Scratch. Over his four days in Lowell, he provided scouting information on righties Kevin Steen, Algenis Martinez, Dioscar Romero, and Daniel Gonzalez, as well as left-hander Enmanuel De Jesus. In the latest SoxProspects.com Featured Video, we show some of Sam Travis' final at-bats before he tore his ACL, ending his season early. In the video, he faces off against two of the best pitching prospects in baseball, right-handers Tyler Glasnow and Jameson Taillon, who has since been promoted to the majors. Since SoxProspects.com started, it has been a free site with incredible information that goes into incredible depth and detail. We want to keep it a free site, but in order to do so we need your help. Our Annual Drive is going on as we speak, and it is the only time over the year we will ask for donations. Small or large, every little bit helps and goes towards enabling us to continue to cover the Red Sox farm system at the high level you have come to expect. More information on how to donate can be found here. Third basemen Rafael Devers led off this morning's Baseball Prospectus Monday Morning Ten Pack. Their report says that Devers light production thus far this season is not a huge red flag, but it may ultimately slow his development a bit. They also accompany the report with some video of Devers. Baseball America also put one Red Sox prospect on this week's Hot Sheet, first basemen Josh Ockimey after he went 7-for-13 with three doubles and a home run. They also quote his manager, Darren Fenster, who says that his pitch recognition has improved as evidenced by his .429 OBP. Matt Collins at Over the Monster notes the lack of depth in major league ready starting pitchers and wonders if the next guy to get a shot could be righty Aaron Wilkerson. Thus far in 2016 split between Portland and Pawtucket, Wilkerson has thrown 78 1/3 innings with a 1.95 ERA, 1.05 WHIP, and 89 strikeouts to 24 walks. Starting pitching is not the only place the Red Sox are hurting for depth. After sending Chris Young to the disabled list, they are also quite thin in left field. Despite that, the Providence Journal's Brian MacPherson says that it is not yet Benintendi time. The Red Sox announced this week that they have signed five additional 2016 draftees. They are catcher Alan Marrero (8th round), left-hander Kyle Hart (19th round), outfielder Granger Studdard (22nd round), and righties Hunter Smith (24th round) and Jared Oliver (26th round). All of these players were assigned to the Gulf Coast League, and none of their signing bonuses are known at this time. Many draft picks are still yet to officially sign and the deadline for such signings is July 15th. The biggest one for the Red Sox is obviously 12th overall pick Jason Groome. Despite being possibly the top high school pitcher in the draft, Even Drellich of the Boston Herald says that the Red Sox must be smart in their signing of Groome. As part of the article, Drellich also notes that he has heard that fifth-round pick Michael Shawaryn will likely require a bonus of $600,000 or more, which would be well over the slot of $375,500 for the 148th overall pick. Players will retire from the game for a variety of reasons, but Anthony Varvaro's is particularly interesting - he is retiring to become a Port Authority police officer as SILive.com's Cormac Gordon writes. Tubbs (pictured, left) was probably not the best bet to win player of the week, but the 23 year-old certainly made the most of his playing time. Playing in four games this past week, Tubbs had hits in all four and multiple hits in all but one. His signature game came this past Saturday where he went 3-for-4 with a home run, a double, two runs scored, and four RBI. 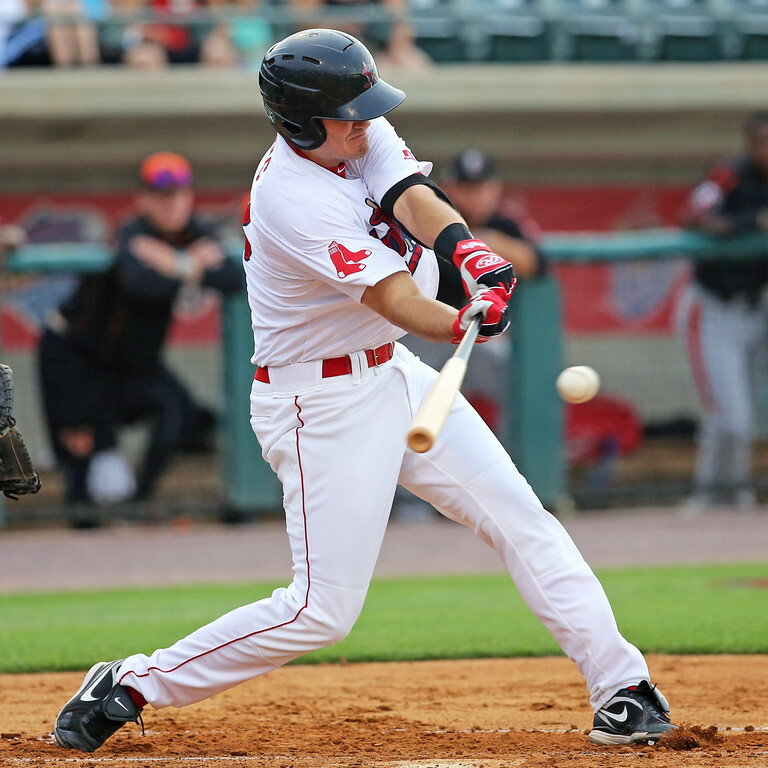 After beginning his professional career at Lowell last year, Tubbs hit .216/.303/.314 over 47 games. Thus far in 2016, he only has 18 total at bats, with the large majority obviously coming last week. When you add in his other five at bats, the incredible week last week moves his overall line on the season to .444/.600/.722. Journeyman O'Sullivan has seen time with in the majors for a variety of clubs in each of the last four seasons, including three appearances for the Red Sox thus far this year. This past week he showed why teams keep calling him up. On Monday he faced the Syracuse Chiefs going eight innings while only allowing one earned run on seven hits while striking out four. That start seemed hard to top, but the 28-year-old managed to do just that. On Saturday, O'Sullivan was dialed in against the Scranton/Wilkes-Barre RailRiders, throwing seven shutout innings while only allowing four hits without a walk and striking out six. That strong week brings O'Sullivan's ERA in Pawtucket down to 2.79 on the year to go with a 1.11 WHIP. It also was enough to earn him the International League Pitcher of the Week honors. However, his results have been far different in Boston with a 7.94 ERA and 1.85 WHIP, but with more weeks like this one and he may get another shot in Boston. Photo Credit: Michael Kopech and Tucker Tubbs by Kelly O'Connor.